Fees, interest and unused goods and services keep draining our bank accounts. BOSTON (TheStreet) -- The Kardashian Kard is no more. The prepaid debit card promoted by the surgically enhanced coven of Kim, Khloe and Kourtney Kardashian will no longer occupy tweener wallets. It was announced Monday that the reality show trio has yanked the Master Card ( MA - Get Report)-branded plastic that bore their images following consumer group outrage and a threatened investigation by Connecticut's attorney general. Fees on credit and debit cards are just the beginning of calculating how much money consumers lose each year -- but a good one. Average credit card debt per spendthrift household is estimated at $15,788. Among the laundry list of fees attached to the card (which, a statement from the issuer showed, had only about 250 takers) were $99.95 for the initial card purchase and 12 months of fees, a $7.95 monthly fee after the initial purchase period, $1.50 for ATM withdrawals, $2 for bill pay (each item) and $9.95 for a card replacement. Even canceling the card would set you back $6. Before one gets too amazed at the audacity of these fees, keep in mind that millions of Americans lose thousands of dollars every year in equally unnecessary expenses, fees, interest, convenience charges and paid for, but unused, services. Any conversation about wasted money will inevitable turn to credit cards and the hefty price paid for their convenience. There are approximately 610 million credit cards held in the United States, and the average credit card debt per household that has such debt is $15,788, according to the Federal Reserve Bank of Boston and CreditCards.com, part of the Bankrate Online Network. 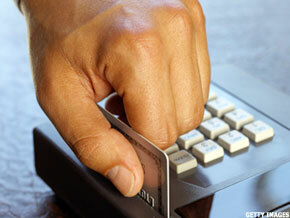 The site crunched out that the average APR on a credit card with a balance is just shy of 15%. Total U.S. revolving debt (98% of which is made up of credit card debt) was $852.6 billion as of March. All of these factoids add up to megabucks being handed over to credit cards companies each year. Even with regulations imposed by federal reforms this year, it is unlikely Americans will stop carrying over balances, and paying the price for doing so, any time soon. Once considered a devastating and embarrassing faux pas, consumers these days actually seem to relish the opportunity to kite checks. As many as 75% of bank customers have opted to keep overdraft "protection" and the fees incurred, according to The Wall Street Journal. Illinois-based Moebs $ervices, a banking analyst, estimates banks will collect upward of $38 billion in overdraft fees next year, up from this year's estimated $35.4 billion. Last year, $37.1 billion was collected from overdrawn consumers, and the median overdraft price increased to $28 per check this year from $26 in 2009. Economist Mike Moebs points out that overdraft fees are so high that consumers hit by them the most frequently could save money by instead taking out one of those much-maligned payday loans. "The average amount overdrawn on checking accounts by about 70% of consumers, according to the General Accounting Office and the FDIC, is less than $100," Moebs says. "Consumers who use a payday advance loan for $100 or less will pay an average of $17.97, which is 33% less than the $27 it costs for an overdraft of that same amount from a checking account." According to the International Health, Racquet & Sportsclub Association, there were 45.3 million gym and health club members last year and health club attendance averaged 102 days. That means on average, 263 days of each annual membership go unused. Assuming that a monthly membership, on the low range of things, is about $30 a month, that's $258 a year being paid by the average customer for unused days. Nationwide, that's billions of dollars being spent on nothing more than guilt over an abandoned New Year's resolution. Massachusetts-based research firm TowerGroup, a subsidiary of Corporate Executive Board ( EXBD, issued its annual overview this week of the gift card industry. Spending on gift cards for this year's holiday shopping season will increase for the first time in three years, reaching $91 billion in sales, it estimated, and could hit $100 billion by 2012. The good news: In addition to the increase in spending on gift cards, "breakage" -- industry jargon for the value left unused on gift cards -- is expected to decrease by almost 50% since 2008, to 3.1%. The change is owed to new federal regulations. The bad news: that's still $2.5 billion consumers will never collect on. How about rebates? Those deals on electronics and cell phones sound great -- $50 off if you just clip the UPC symbol and mail it in. Blame procrastination, forgetfulness and tricky fine print for the fact that up to 60% of rebates are never filed and billions of dollars will never be collected. Though numbers aren't readily available, consider other services you pay for but don't use -- unused cell phone minutes and data allowances, ignored or expired gift card balances, lingering over one Netflix ( NFLX - Get Report) movie all month, paying for premium cable channels that go ignored until the next season of Entourage starts and all those impulse buys from Amazon ( AMZN - Get Report) that you'll only glance at on your Kindle. The ever-multiplying array of airline-imposed fees is another costly modern inconvenience. A typical bag of checked luggage will set you back at least $25 to $35 each way on many airlines. Baggage fees charged by airlines totaled a mere $464 million in 2007. For the first half of this year, nearly $1.7 billion has already been collected in these fees, according to the federal Bureau of Transportation Statistics. Delta Airlines ( DAL led the pack with nearly $474 million in fees. Rounding out the top five were American Airlines ( AMR ($280.5 million), U.S. Airways ( LCC ($256.3 million), Continental Airlines ( UAL ($167.6 million) and United Airlines ( UAL ($155.9 million). It's not just extra baggage that has us paying through the nose. Fees related to canceling and changing reservations has earned airlines more than $1.1 billion in the first half of this year. To fight the fees, however, one must first know what they are. A survey earlier this year by the National Business Travel Association found that 61% of those who responded said it was "very important to know the total cost of the trip," but 58% said they were "unable to track the total amount spent on ancillary fees."